Long Island, and the state of New York as a whole, is no stranger to talented, promising vegan chefs who can’t help but stir up a buzz with their delicious culinary creations. From Jay Astafa, the young vegan chef who convinced his father to let him curate a vegan menu at his family’s pizzeria and now current creator of the first all vegan restaurant on Long Island, 3 Brothers Vegan Cafe in Copiague, NY to Brooklyn native, vegan food magician and author of vegan cookbook staples like Veganomicon and Isa Does It: Amazingly Easy, Wildly Delicious Vegan Recipes for Every Day of the Week, Isa Chandra Moskowitz, there is undeniably no lack of vegan food masters in The Empire State. 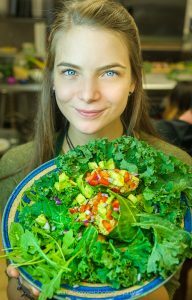 This same culinary talent, and creative flare for food and flavor, can be seen and experienced with Elyse Clark, the vegan chef at Batata Cafe in Northport, NY. Hi Elyse – Thank you so much for sharing our interview!